Ephesians 6:24 Grace be with all those who love our Lord Jesus Christ in Sincerity. Amen. Greetings to all of you in the saving Name of our living God Christ Jesus, who has joined us and united us to a common faith and love. Dear brothers, thank you for your encouraging e-mail letter and I am sorry for my late reply, it happened because of the busy flood relief schedule tour. It is really a matter of gratification to note that the honorable CLC came forward to extend their kind help in saving the CLCI flood affected people from these miserable situations. Dear brothers, this is the latest information regarding our CLCI flood victims. More than 12 congregations and 36 preaching stations bore the brunt of the worst floods in hundred years caused by the recent week-long torrential rain in the state of Andhra Pradesh, which rendered hundreds of thousands homeless and hundreds dead, and wrought unimaginable devastation. We have started conducting relief operations for the flood victims in the affected CLCI congregations. We regret to inform you that there are four more deaths in the CLCI flood affected congregations, in total 7 deaths were happened. They are six men (including one pastor) and one lady. We find it difficult to comfort those families who have lost their dear ones, especially who have lost men. Indeed it is very hard to fill the gap in the families caused by their deaths. Also we regret to inform you that many people have been suffering from contaminated diseases. Due to the effect of the disaster, almost all the water has polluted, thus becoming a cause to spread various dangerous diseases like Diarrhea, Dysentery, Typhoid, Cholera, etc. These diseases attacked many of our people. For these we have been providing medicines, bleaching power, and phenyl. Seven medical camps are being conducted under the supervision of Dr. Tagore, our CLCI family doctor, with the help of his associates. Also we have conducted a special medical camp for cattle. We regret to inform you that many families lost their cattle, mainly water buffaloes which are the main source of their livelihood. We have been doing relief as per level best. 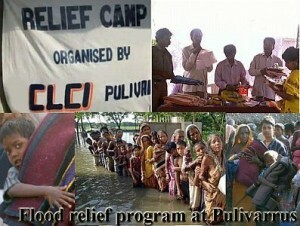 We have served cooked food and biscuits in more than 20 flood affected villages for our CLCI members. We have served cooked food (rice and sambar) twice a day for two days for more than three thousand affected members in nearly 20 villages. Relief work is continuing by distributing blankets and extra rice. We have been distributing more rice and some used clothing to the affected members. Nearly 100 volunteers including pastors, elders, and youth and seminary students from the CLCI participated for two weeks in helping their fellow CLCI brotherhood. Especially they did very hard work in removing the slush out of their damaged huts. Food distribution and survey work of damage caused by the floods are being carried out by the volunteers. We are working in evaluating the need of the hour, which will be provided in the second phase once the water recedes. The flood water still is there in many villages. According to the information we received from our pastors and evangelists, from our CLCI it is estimated that around 1250 families are the worst affected and lost their property, have lost every rupee of their own, lost their huts, household goods and cattle etc, and this number may increase also. The immediate requirement of these families is to be settling down to their daily chores with their necessities. Hence, the CLCI is planning to supply the kits to these families which will enable them to start off their living. Each kit will consist of kitchen utensils, food grains and material of daily use. In this second phase we are planning to provide these following materials. A survey is being conducted to do the relief programs. These following are the estimations of the items that we have been praying and planning to distribute among the 1250 affected CLCI families during the second phase. 1. Kitchen vessels (one plate, one tumbler, one rice vessel, one curry vessel, one plastic bucket and jug) $2 to $3 for each of 1250 families. 6. Possible help for repairing the damaged churches and prayer sheds. 7. Possible help to the each family of the man, who was killed. 8. Possible help to the families who lost their cattle, (depends upon the budget). 9. Possible help to the school children who have lost their books (notebooks, slates). Dear brothers, after much prayerful consideration, we have planned these estimations and we will go ahead as per the available budget. We are praying our Almighty living God Christ Jesus for His grace to grant us courage and strength for our affected members to recover quickly from this miserable crisis. Dear brothers, we have been trying our level best to take care of all the necessities of our CLCI congregations and members until the restoration returns them to normalcy. We thank you once again for your valuable service and help. Your prayers surely will help mitigate the sufferings of these poor CLCI members. Thank you very much.